A few weeks ago, we reviewed Mario Kart for the SNES. And it was a mighty fine game. However, I believe there is one game that topples it. In my eyes, this 1995 beauty from Ubisoft just about edges Nintendo’s offering. The format is very similar, take control of one of 8 racers in a selection of tournaments to see which one is the best. The characters themselves are rather cartoony and stereotypical, but each one drives and handles differently (by and large, it can be tricky to tell the difference between two similarly handling cars). Characters include Frank, the Frankenstein monster from Transylvania, Surf the bleach blonde baywatch esque driver from Australia and Helmut the old Red Baron pilot from Germany. These characters haven’t the familiarity of the characters from Mario Kart, so to play on obvious stereotypes and legends is a great idea. 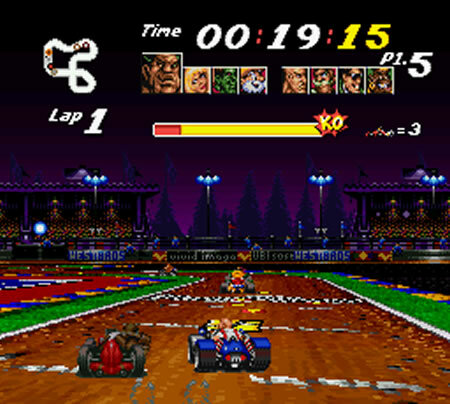 The main game plays similar to Ninty’s offering. In it you race around various tracks, there are 24 tracks in all, with each character having 3 themed tracks each. These tracks appear in championship mode, and also you can create a “custom cup” of your favourite tracks for racing in. There are no weapons (different from Mazza) but what you do have is two punches left and right (activated by the L and R buttons) an attack forwards (this is usually a grappling hook, or a flying maneouver) and a sideways attack such as expanding tyres. These are themed for the cars so Hodja, the Turkish genie esque character, takes to the skies on a magic carpet. It adds more personality to the game, and it’s something Mario Kart either at times does, or doesn’t. I like it. 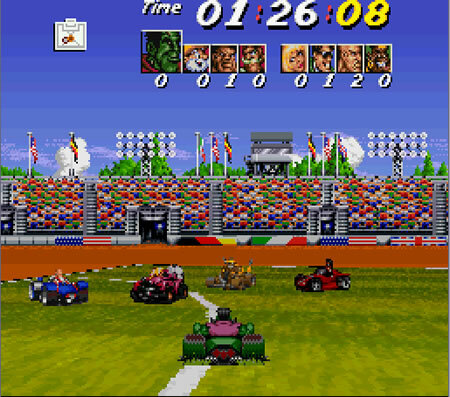 Another thing to set it apart from Mario Kart is that there are more modes, away from the racing there’s an interesting WWE esque Rumble mode, where the objective is to eliminate all other competitors from the ring. Depending on the difficulty level, this can take anywhere from 30 seconds to 10 minutes, and it’s quite a good mode, and – when you learn to avoid people – you can become quite adept at it. The second mode is an ingenius Soccer mode, which recreates a half pitch, one goal, “Wembley Singles” game. You have a time limit to score as many goals as possible, however the scoring is a bit skewiff on it (you can draw, but say if two people score 2, and the rest score a mixture of 0 and 1, then everybody gets a point. That doesn’t seem fair to me), but it’s still a good laugh, and works really well with your mates. The soccer mode was fun, look out for the banner for Woking FC. Yes, mates. This game supports upto 4 people around one machine. I’ve played it a couple of times and the football game is definitely the best with friends. It’s a proper laugh with beer and pringles. The other modes I’m afraid the tracks and arenas are too sparse to be fun in my eyes. There are a few niggles with it, the first is the difficulty level. It’s far too easy. Championship on hard mode can be won without too much difficulty, as even if you don’t win a race, you usually win the fastest lap and star bonus points awarded at the end of the race, this puts you in first (providing the chap in first won anything else). It really takes a lot out of the game when you can win at a canter. However, on the plus side, you will throw the remote at the TV a lot less than with Mario’s offering. The other thing is this game sorely needs a battery backup. Cups take ages (especially the gold cup), and four of the tracks you need to unlock. Thankfully, a code is available to get them, but even so it’s a bit of a faff. Plus all your times, scores and records are deleted after each reset. It’s not good. However, don’t let this detract too much. I do love this game, it’s remarkably fun. The Mode 7 chip on the SNES really handles the levels well, and – save for a few niggles, this game would be the best karting game ever (at the moment, I believe Mario Kart Wii has this channel). It does in my eyes beat the original Mario Kart in terms of fun, playability and lack of frustration, but Mario Kart did catch up in the second games, as Street Racer’s Saturn and Playstation offerings, whilst a lot of fun, didn’t add anything else to this already fabulous game. If you get the chance, get the SNES verion of this game (the Megadrive’s is terrible), I promise you it will be worth it. Awesome Review , I agree that Street Racer was a legendary game!